"The formation of future priests, both diocesan and religious, and lifelong assiduous care for their personal sanctification in the ministry and for the constant updating of their pastoral commitment is considered by the Church one of the most demanding and important tasks for the future of the evangelization of humanity. 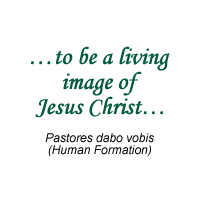 To download "Pastores Dabo Vobis", please click on the link below. "Spiritual formation...should be conducted in such a way that the students may learn to live in intimate and unceasing union with God the Father through his Son Jesus Christ, in the Holy Spirit. Those who are to take on the likeness of Christ the priest by sacred ordination should form the habit of drawing close to him as friends in every detail of their lives. They should live his paschal mystery in such a way that they will know how to initiate into it the people committed to their charge. They should be taught to seek Christ in faithful meditation on the word of God and in active participation in the sacred mysteries of the Church, especially the Eucharist and the Divine Office, to seek him in the bishop by whom they are sent and in the people to whom they are sent, especially the poor, little children, the weak, sinners and unbelievers. With the confidence of sons they should love and reverence the most blessed Virgin Mary, who was given as a mother to the disciple by Jesus Christ as he was dying on the cross." The commitment to study, which takes up no small part of the time of those preparing for the priesthood, is not in fact an external and secondary dimension of their human, Christian, spiritual and vocational growth. In reality, through study, especially the study of theology, the future priest assents to the word of God, grows in his spiritual life and prepares himself to fulfill his pastoral ministry. "To be pastorally effective, intellectual formation is to be integrated with a spirituality marked by a personal experience of God. In this way a purely abstract approach to knowledge is overcome in favor of that intelligence of heart which knows how 'to look beyond,' and then is in a position to communicate the mystery of God to the people." "(Pastoral theology) needs to be studied therefore as the true and genuine theological discipline that it is; pastoral or practical theology. It is a scientific reflection on the Church as she is built up daily, by the power of the Spirit, in history; on the Church as the "universal sacrament of salvation," as a living sign and instrument of the salvation wrought by Christ through the word, the sacraments and the service of charity. Pastoral theology is not just an art. Nor is it a set of exhortations, experiences and methods. It is theological in its own right, because it receives from the faith the principles and criteria for the pastoral action of the Church in history, a Church that each day "begets" the Church herself, to quote the felicitous expression of the Venerable Bede: "Nam et Ecclesia quotidie gignit Ecclesiam." 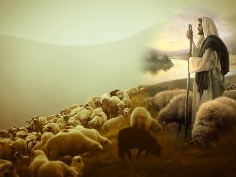 And so pastoral formation certainly cannot be reduced to a mere apprenticeship, aiming to make the candidate familiar with some pastoral techniques. The seminary which educates must seek really and truly to initiate the candidate into the sensitivity of being a shepherd, in the conscious and mature assumption of his responsibilities, in the interior habit of evaluating problems and establishing priorities and looking for solutions on the basis of honest motivations of faith and according to the theological demands inherent in pastoral work." The ministry of the priest is, certainly, to proclaim the word, to celebrate the sacraments, to guide the Christian community in charity "in the name and in the person of Christ," but all this he does dealing always and only with individual human beings: "Every high priest chosen from among men is appointed to act on behalf of men in relation to God" (Heb. 5:1). So we see that the human formation of the priest shows its special importance when related to the receivers of the mission: In order that his ministry may be humanly as credible and acceptable as possible, it is important that the priest should mold his human personality in such a way that it becomes a bridge and not an obstacle for others in their meeting with Jesus Christ the Redeemer of humanity. Future priests should therefore cultivate a series of human qualities, not only out of proper and due growth and realization of self, but also with a view to the ministry. These qualities are needed for them to be balanced people, strong and free, capable of bearing the weight of pastoral responsibilities. They need to be educated to love the truth, to be loyal, to respect every person, to have a sense of justice, to be true to their word, to be genuinely compassionate, to be men of integrity and, especially, to be balanced in judgment and behavior." 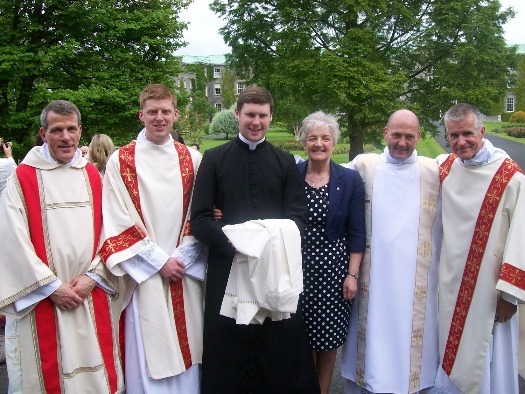 Sr. Maryjo Corcoran (Clinical Pastoral Education Supervisor) joins in the celebration of Ordination to Diaconate on June 1st 2014 at St. Patrick's College, Maynooth. Pictured left to right: Rev. Leo Creelman, Rev. Shane O'Neill, Mr. Aaron Slattery, Sr. Maryjo, Rev. Brian Slater and Rev. Brian Griffin. All of the men pictured have participated in Clinical Pastoral Education as part of their formation journey for priesthood.